Home DIY Natural Blog Food Is Loose Leaf Tea Superior to Tea from Tea Bags? 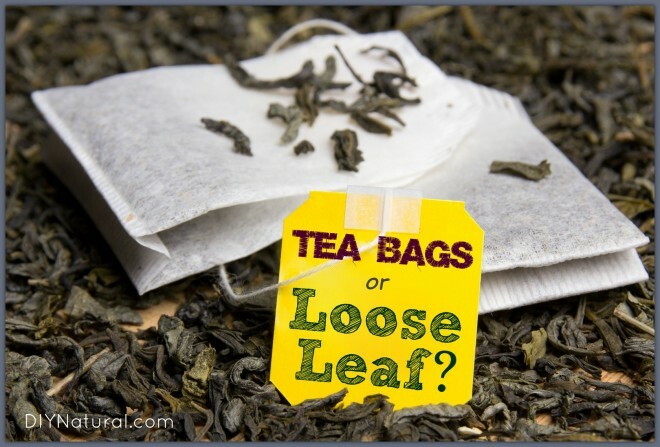 Is Loose Leaf Tea Superior to Tea from Tea Bags? When I want a good tea to serve guests or to cuddle up with in front of the fire, I head out to my apothecary and mix up a loose leaf tea blend to match my mood. I tend to forget that, for most people, tea usually comes in a tea bag. That is, until I head out for a speaking engagement in a new town and forget to bring my own tea! It feels like a violation of some herbalist cardinal rule to forget your own loose leaf tea blends at home. I creep through the grocery aisles hoping no one recognizes me. I feel like I should have on some sort of disguise because if someone catches me buying some sub-standard blend I’ll be called out – “Visiting herbalist on aisle 4! Visiting herbalist on aisle 4 buying pre-packaged tea!” My own ridiculous worries aside, I struggle when this happens to find a quality tea. There are very few tea bag manufacturers using quality herbs in their tea. On the herb farm we know that the less we process our herbs the higher quality we are able to give our customers. We try not to crumble our herbs and keep them as whole as possible. This is because every time you break the surface area of a plant part, the more area is presented to the air for oxygenation to damage flavor and benefits. Now, think about what happens when you have to fit herbs into a tiny bag. That’s right, you’ve got to crumble those herbs up pretty good. In the case of some of the really cheap herb producers you are really getting the siftings, or the bits, of leaves that were so small and crumbled that they fell through the conveyor belt to the floor. I don’t, as a rule, ever purchase tea in bags. It became a hassle to find bags that were not glued. I avoid the polyvinyl chloride found in a tea bag that has been stuck together in this way. Occasionally I come across a tea maker that is either stapling their tea bag together or on rare occasions, sewing it. It is a consideration, of course, that stapling and sewing takes more time and therefore results in a higher priced tea bag. My husband once bought me a very expensive biodynamic tea for Christmas. He was particularly pleased with himself that he had found a tea bag that I would feel comfortable using. When I pulled out one of the few bags nestled at the bottom of the tin he audibly gasped. Inside the machine-stitched tea bag was comparable to what you’d see on the plate at a very high-end, minimalist restaurant… almost nothing. While he was upset, I was thrilled. While he grumbled something about spending half his Christmas budget on two leaves and a twig per bag, I happily poured my first cup of hot water over this tiny bag. As I anticipated, the very small amount of herb expanded when the water hit it and together they loosely filled the bag without being squished together. I’m sure it is difficult for tea manufacturers to sell a lightly filled bag, but here is why you should prefer it – the more surface area your water is able to interact with in your tea cup the more flavor and phytochemicals you will be able to extract. When you get an overfilled bag you are not likely to get as flavorful or beneficial cup of tea as you would if they were free-floating. I choose to buy loose leaf teas for the same reason I insist on selling them to my customers. It is a superior way to get flavor and benefit from the plants we make with tea. Loose leaf tea floats freely in your teapot, there is no concern over glues or other chemicals, and you can see the quality. When you see the quality of your herb when you buy it, there is no concern that something is being hidden from you behind that gauzy tea bag. I purchased loose leaf tea for the first time yesterday. I am working towards eliminating my coffee/caffeine addiction. I did not expect the difference in taste! The loose leaf tea is so much better! After I use up my herbal tea bags I will never purchase tea in a bag again. Great article! Would there be any health value to adding brewed (or dry) tea leaves to smoothies or in soups, etc.? I’m sure you know that a beverage made of herbs is called a tisane and not a tea. Only a beverage made of tea should be called tea. I know that it is common for people to call a beverage made of herbs a tea but that is wrong. It’s like calling a soda a beer. Just my opinion and one of my pet peeves.